WHAT IS A "NEGATIVELY TILTED TROUGH"? In forecast discussions you will come across the terms positive, neutrally and negatively tilted trough. When a trough is positive or neutrally tilted it is usually not referenced at such. However, when it becomes negatively tilted it will be referenced as such. The tilt of a trough is the angle the trough axis makes with lines of longitude. 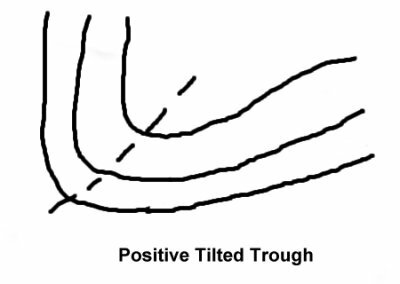 A negatively tilted trough tilts horizontally (parallel to surface) from the northwest to the southeast. What is the big deal about having a negative tilt? (2) indicates strong differential advection (middle and upper level cool air advecting over low level warm air advection). This increases thermodynamic instability. (3) Indicates good vertical wind shear. A deep low pressure, a negatively tilted trough, and a warm and moist warm sector combination east of the Rockies often produces a severe weather outbreak. What causes the negative tilt? (4) Occlusion of low pressure. 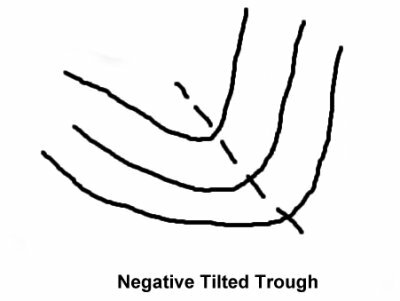 Below are a positive and negative tilted trough.